Is this the big clean up in the detergents industry? For almost two decades global giant Procter & Gamble (P&G) has scrubbed along at a sedate speed, content to live in the shadow of Hindustan Lever, the 1,000-pound gorilla of the Indian sub-continent. Now P&G Home Products Ltd managing director Shantanu Khosla is throwing down the gauntlet for a David and Goliath-style battle that threatens to turn parts of the FMCG market topsy-turvy. The big move came two weeks ago when P&G pulled a surprise on its competitors by slashing the prices of the big pack Ariel and Tide by between 25 per cent and 50 per cent. The move forced an immediate response from HLL which shaved a hefty 26 per cent to 50 per cent off its Surf Excel and Surf Blue detergents. In January 2003, HLL had slashed Surf Excel prices from Rs 153 to Rs 135. "We are determined to face any competitive challenge unblinkingly because we have a deep belief in the long term potential of the Indian market," says Manvinder Singh Banga, chairman of the Rs 10,000 crore (Rs 100 billion) HLL. But the detergent offensive was only one part of a battle that is spreading from one counter of the grocery shop to another. This week came a rumour that P&G is about to launch its world-famous megabrand Crest in the Indian market. It's a rumour that has done the rounds many times before but this time there was one sign that it might be true: Colgate Palmolive which dominates the Rs 3,200 crore (Rs 32 billion) toothpaste business with a 45 per cent share has just slashed prices two days ago. HLL managers claim that they are not going to respond to such drastic measures. What's the game that the giant consumer goods companies are playing? Is this a dog-eat-dog price war that could end up bleeding all the players? Alternatively, is P&G suddenly making a bid to become a mass volume player in the Indian marketplace -- till now it has been forced to cultivate the image of being a premium products company. That's very different from its image in other parts of the world. "This is not a price war as everybody makes it out to be. This is value correction," says P&G's executive director Ashok Chhabra. He claims that in-house research had revealed that many middle class Indian households always had a pack of Ariel or Tide but they were seldom used. "They were used only for good clothes," he adds. To drive volumes, the price barrier had to be amended. "Consumers are not driven by price but by value. For us, value is the Bible," says Chhabra, sticking to the official line. He claims that P&G's price slimming diet began three years ago. Chhabra has a point. P&G has been steadily slicing prices or offering bigger packs for the same price for the last three years. It started back in April 2001, by knocking 30 per cent off Whisper Ultra its sanitary product. In October the same year, the Vicks Vaporub moved from 25gm packs to 35gm packs but the price wasn't hiked. Then in January last year, prices of the 7.5ml Rs 4 sachets of Pantene and Head & Shoulders were cut to Rs 3. In September P&G moved on another front and started selling detergents in sachets in response to HLL's price cuts. And on January 20, it introduced a cheaper shampoo Rejoice in two pack sizes -- Rs 2 for a 7.5 ml sachet and Rs 39 for 100 ml. "This is nothing new for P&G. It all depends on its priority at any given point in time. It is always drawing from its global experiences. I wonder why they didn't chase volumes earlier," says a former P&G manager who has seen the company operate in four continents. But P&G is almost certainly aware that it has put HLL in a bind. Around the globe the two companies face each other on an equal footing. In India HLL is a local giant that has been here for almost 75 years and P&G is just a puny rival. Nevertheless, with its price-cutting tactics P&G is taking advantage of its minuscule size. 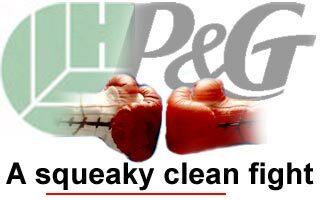 HLL will be forced to take the bigger hit if it matches P&G's price cuts. Competitors believe it could be around Rs 200 crore (Rs 2 billion). HLL dominates the detergents market with a 40 per cent share, riding on a plethora of brands like Surf Excel, Surf Blue, Rin and Wheel. By contrast, P&G has around 5 per cent. But HLL claims it has no plans to cut prices on its Wheel and Rin detergents which reside in the middle and lower segments which together account for 90 per cent of the market. "Not only has P&G erased what was once a premium segment in detergents, it has changed the dynamics of the game," says a competitor. Moreover, the gradual sinking of pack sizes in the FMCG industry have also hit the strategy -- used around the world --of offering more economical big packs. That's because, with fierce competition, players have been cutting their sachet prices to such an extent that they work out cheaper than the economy packs. For example, in sachets, Surf Excel's 120 per cent premium over the mid-priced Rin Supreme is down to 10 per cent. HLL Chairman Banga is putting a brave face on the new developments. But HLL with a 40 per cent share of the Rs 4,500 crore (Rs 45 billion) detergent market can't afford to make a misstep. The stock market seems to have sensed that HLL is in a dilemma as P&G mounts its offensive. The HLL share price has fallen steeply this week and has contributed heavily to the sharp fall of the Sensex in the last few sessions. P&G, of course, insists that it's not doing anything out of the ordinary. The world over including China, P&G products have been aimed at the mass markets. But in India, since the mid-'80s it has sold highly priced products and has ended up with an elitist tag. Even its first product -- Whisper-- launched in 1990 created a new high-end category in the then minuscule sanpro market. Ariel, launched a year later was yet another top end offering. The company didn't really have an alternative because HLL was such a powerful mass market rival. "That was the way to go then as the market was completely dominated by HLL and penetrating any category would have been tough," says an ex-P&G manager. But the result was that P&G has stayed small. "My ad budget for shampoo in China was three times the Indian turnover," says a P&G manager. P&G has had a relatively tough time in India. It is now a Rs 750-crore (Rs 7.50 billion) group with two units. The listed Rs 438 crore (Rs 4.38 billion) P&G Hygiene & Healthcare manufactures the Vicks healthcare range, feminine care Whisper and does contract manufacturing of detergents. The parent has a 65 per cent stake in this entity. P&G Home Products is a fully-owned subsidiary of the parent with brands like Ariel, Tide, Pantene, Head & Shoulder and Rejoice. While the first two are made in India, the shampoos are imported. Over the years, the categories that it operated in were increasingly getting cluttered by lower end products that offered reasonably good quality. Moreover, growth in many of its categories was stagnating and maintaining topline growth was getting tough. And like most of its competitors, squeezing out costs from its systems became paramount. Today, a P&G insider says that the parent's strategy of offering a standardised product for the world is no longer a reality. "Now, we are constantly encouraged to value engineer, to formulate different replacement products at different costs without affecting quality," he says. "Just like in the auto industry, indigenisation drove down prices and spurred sales, the same is happening with Ariel and Tide. For us, it is a strategic decision and not a financial one to chase market shares," he adds. P&G has moved sharply in other areas when sales slowed Take the Rs 300 crore (Rs 3 billion) sanpro market. From a high of 39 per cent six years ago, it was down to 28 per cent in 2000, the year Whisper Ultra was launched. To counter that it cut prices in 2001 and the move seems to have worked. Today, Johnson & Johnson's low priced Secure is cleaning up volumes but P&G's share is a steady 25 per cent. And within the Whisper category, Ultra, which has become the flagship brand has seen market share grow from 5 per cent to 7.5 per cent. P&G's muscle flexing comes at a time, when the going is tough for all its competitors. Consider Hindustan Lever. Five years after the country's largest fast moving consumer goods company took on the might of Colgate Palmolive, with its Pepsodent toothpaste, it is now pitched against P&G. This is something that even Banga mustn't have expected when he released his annual show of numbers a month ago. "At the moment, there appears to be no respite for HLL," says a competitor. Adds an analyst tracking the sector, "Just when we thought that it had finally got its price points right to thwart competition from low priced warriors, than the price war has changed venues to the premium multinational arena. Being clobbered from both ends, it is going to be under even more pressure to maintain its bottomline." HLL was once a growth king that could do no wrong. Three years ago former HLL chairman Keki Dadiseth reflected the confidence that everyone felt when he predicted that the company would double turnover every three years. What has gone wrong and is the FMCG giant slowing down? Take a look at HLL's decade-old track record. Since 1993, sales have jumped five-fold to touch Rs 10,142 crore (Rs 101.42 billion) in 1999. Since then sales have stagnated with last year closing at Rs 10,138 crore (Rs 101.38 billion). What's more, its operational and marketing efficiencies too kept the margins rolling, pushing it high on parent Unilever's radar. Operating margins have zoomed from 13.35 per cent in 1993 to 24 per cent last year. In 1999 the bottomline was Rs 1,539 crore (Rs 15.39 billion) and that moved to Rs 2,436.49 last year. But the company is facing new challenges. Sales have stagnated since 1999. And analysts feel that the latest price cuts on its high value detergents could badly dent it. Last year, its operating margins on soaps and detergents were 24.85 per cent. So will Banga's "growth, growth and more growth" strategy go for a toss? Or does HLL have some aces up its sleeve? Are most of its 30 power brands under threat? "We're very strong today but we want to be much stronger and bigger tomorrow. That's why we will make sure that we are not in any way impacted by any competitive issues today," says Banga. There has been criticism that its focus on margins have hit sales. But Banga denies this. "The cost reduction exercises have come through genuine innovation in supply chain and investment in technology." he says. Sure. But its results were nothing to write home about. This year sales barely inched ahead 3.6 per cent and operating profit was up marginally by 1.06 per cent, with a 1.5 per cent drop in margins over the previous year. D Sundaram, finance director of HLL, says, "This should be viewed in the context of aggressive pricing in certain categories and higher investment in quality." There have been areas where the company has been hit badly. In beverages, margins fell 80 basis points. The continuing competition from loose tea players and the re-emergence of Tata Tea, has given HLL's Brooke Bond-Lipton brands a run for their money. Managers in the company say that in 1998, the Brooke Bond-Lipton combine sold 133,000 tonnes of tea. HLL's current tea sales are pegged at 75,000 tonnes of tea. "The previous couple of years, we were focused on increasing our growth margins and rationalising our brand portfolio. Now that we have the portfolio we want, we are totally focused on growth. Last year, our tea business grew by six per cent," says Banga. Some analysts feel that HLL has squeezed too much from its products. Others claim that HLL's portfolio of 110 brands with 300-odd stock keeping units (SKUs) is weighing them down. Even as it has identified 30 power brands, many of its other brands too have critical mass and are over Rs 100 crore (Rs 1 billion) each. And with most of its categories under threat from smaller players, the company's attention is diffused, they say. Banga doesn't believe so: "Of course, business is tough but we are using our scale to give us competitive leverage." At the same time, HLL is gearing up to launch mineral water in above 25 litre dispenser packs. Then there's Ayush herbal and confectionery, which Banga expects to be big growth drivers in the coming years. The markets seem unimpressed by the multinationals and their shares have been falling sharply in recent weeks. Nevertheless, competitors continue to be wary of HLL. As a competitor put it: "This means they are ready to take a hit on profits to push volumes. And if HLL is getting its act right, then we better watch out."